A rich and diverse tourism offering exists in Donegal. It's a county with a reputation for delivering world-class tourism services and attracting visitors from all over the Island of Ireland as well as from overseas. Alan Rankin, Marine Tourism Strategy in Scotland: A Scottish National Tourism Strategy was launched in 2016 (TS2020) - they have set up sectoral strategies linked to this national strategy, business tourism, marine tourism and a national events strategy. They have successfully linked to local and destination strategies to ensure they are all aligned and tracking activities on the coast. Important things to think about are: Where are the saturation points, where are the dips? What areas need development ? Marine tourism projects include a cohesive marine leisure development strategy for the North West, which links Donegal to the maritime regions of Northern Ireland and the West coast of Scotland. 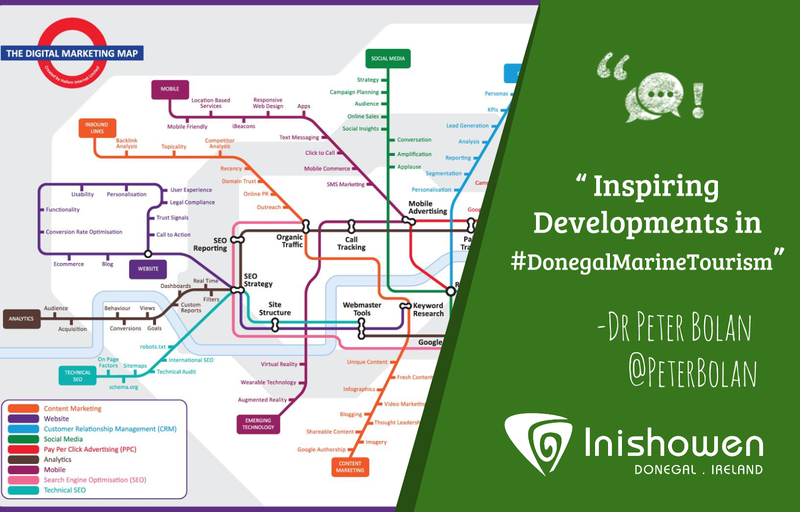 The Donegal Marine Tourism seminar detailed many insights and innovation in the development of new marine tourism products and services. It was a fantastic event and each speaker outlined how companies can provide sustainable development, eco-tourism, job growth and the rejuvenation of maritime communities. Speakers included Olivia Crossan from An Taisce’s Clean Coast initiative, Joy Harron, Marine Tourism Officer with Donegal Tourism and Adrian Harkin from Inish Adventures. Pre-trip planning is always a vital factor for visitors. Give them all the information they need to increase the value of their experience. During their trip, increasingly important is their digital experience while visiting. Research how do they communicate with their holiday snaps and understand which web channels have most engagement. In addition, maintaining this social relationship afterwards is a great way to gain repeat visits. Give the visitor a platform to speak, to post and to promote your business, for free, through content marketing. Knowing the correct factors that we have gone through is the appropriate way to it corning tour would be pretty reasonable that brings a management and that's the way it all would work.